The public workstations now feature Print Smart printing and paid single or double sided printing. 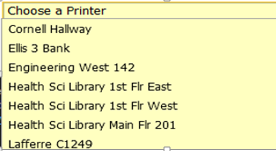 When printing, make sure you choose the correct printer and know the location of that printer. Health Sci Library 1st Flr – located outside the Computer Training room, near the Mac computers. Print from your laptop to a Health Sciences printer using Print Anywhere. Link to Print Smart Account Manager page. Under “Choose printer”, scroll down to the list of “Computing Sites“. Print Smart is available for faculty and staff printing. Color printing is available in Ellis Library. It is also available in other computing sites, the closest being Pershing Hall C240. Other sites for color printing include: Cornell 003, Cornell 004, Clark Mezzanine, Journalism Library, Lafferre Hall, Naka Hall, Stanley Multimedia Center. 3D printing is available in Ellis Library through the Print Anything at MU service located on the main floor near the Reference Desk.